On this page, you will discover everything that you need to know about the collections in the Calphalon Unison vs Contemporary comparison. We’ve done the research and hopefully by the end you will know which line of cookware is best for you. Calphalon Unison vs Contemporary: Which One is Right for You…? All cookware in the Calphalon Unison and Contemporary (Non-Stick) collections are constructed using heavy-gauge aluminum. This heavy-duty construction imbues the pieces with a certain rugged quality. The aluminum exterior is also hard-anodized to ensure durability, even heating, and the ability to be safely used in the dishwasher. The interior of any cooking piece belonging to either the Calphalon Unison or Contemporary (Non-Stick) collection features a three-layer non-stick coating. The outer and middle layer provide increased stability to the cookware while the innermost layer ensures the food being prepared does not stick to the cookware and also enhances the easy-release performance of the non-stick piece. The non-stick coating used in the interior design is PFOA-free, and as such poses no health hazard to the user. Here lies the biggest difference between these two Calphalon cookware lines. Like most quality non-stick pieces in the market, the Calphalon Contemporary (Non-Stick) cookware has a smooth non-stick surface that easily releases the prepared food without any stickiness and eliminates the need to excessively grease the pan. The Calphalon Unison goes a step further by providing users with two different non-stick surfaces to meet specific cooking needs. The Slide Non-Stick Surface acts like the normal non-stick surface found in the Contemporary cookware. It is designed for easy and effortless release of foods prepared without fat or oil such as pancakes, omelettes, and sauces. Most cookware pieces such as griddles, omelette pans, and sauce pans in the Unison collection are usually designed with the Slide Non-Stick Surface. Unlike the ultra-smooth interior of the Slide Non-Stick Surface, the Sear Non-Stick Surface has a rough and textured feel. This surface is designed for flawless browning of fish, burgers, steaks, and even vegetables. It helps to seal in the flavor of the food. Pieces such as sauté pans, woks, grill pans, and roasters in the Calphalon Unison line feature this special and innovative non-stick surface. This dual non-stick surface option provided by the Calphalon Unison line ensures different types of food can be prepared to the utmost satisfaction of the user with little or no inconvenience. The handles of the cookware pieces in both collections are made from cast, brushed stainless steel for durability. They are designed to remain cool to the touch during the cooking process. This perpetual coolness can be attributed to the considerable length of the handles and the strategically-positioned insulated joints. The handles are fitted to the cookware pieces via rivets. Both sets of cookware also come with similarly designed tempered-glass lids. These lids are clear and transparent so users can monitor the progress of the food being prepared without having to take the lid off the pan. Both Calphalon lines have been praised by a vast majority of users for their ability to heat up quickly and evenly distribute this heat to all parts of the cookware. The Contemporary (Non-Stick) collection and the Unison Slide Non-Stick Surface pieces are the best when it comes to heat conduction and distribution on both gas ranges and electric cookers. Unison Sear Non-Stick cookware can maintain a steady heat distribution on gas ranges but are unable to do so on electric cookers. The biggest advantage of non-stick pieces is the ease of cleaning. As foods do not stick to the interior of the cookware, users can quickly clean the pan with as little fuss as possible. The handles of the Unison cookware however pose a cleaning challenge as they are attached to the cookware via rivets, thus creating crevices and gaps for food to get stuck in. The anodized aluminum construction of the Unison and Contemporary (Non-Stick) cookware makes them dishwasher safe. Pans, pots, and lids can be cleaned with the dishwasher. However, non-stick cookware pieces tend to last longer with manual washing. Several users also complained of a slight discoloration of the rivets in their Unison cookware after frequent washing with the dishwasher. Both cookware collections can also be safely used in the oven up to a specified temperature limit. For the Unison collection, the temperature limit for oven use is 500oF while that of the Contemporary (Non-Stick) is slightly lower at 450oF. This feature ensures that prepared dishes can be kept warm in the oven for as long as possible. The Calphalon Contemporary collection includes a stainless-steel cookware line alongside its non-stick line. The construction and composition of these stainless-steel pieces differ from that of the non-stick cookware. The Contemporary Stainless cookware is praised for its heavy-duty three-ply (or three-layered) construction featuring a heavy-gauge aluminum core sandwiched between two layers of brushed stainless steel. The outer and inner stainless-steel layers provide strength and durability to the cookware, while the middle aluminum layer conducts and distributes heat quickly and consistently for even cooking. The combination of aluminum and stainless steel imbues the cookware with remarkable temperature control. The stainless-steel interior however does not easily release foods prepared as well as the non-stick surface without being greased first. They are ideal for cooking processes such as searing, deglazing, and browning. Calphalon Contemporary Stainless cookware pieces are dishwasher safe like their non-stick counterparts. They can also be conveniently used in broilers and ovens and are fitted with long cast, brushed stainless-steel handles that stay cool throughout the cooking process. One of the many advantages the stainless-steel line has over the non-stick cookware is their induction compatibility. They can be used on induction cooktops with impressive results. It is important to note that the Calphalon Unison line in contrast is strictly non-stick and does not feature any stainless-steel cookware. To preserve its non-stick surface, only nylon and wooden utensils should come in contact with the Unison cookware. The non-stick offerings of the Calphalon Contemporary line should also be used with only nylon, coated, or wooden utensils. However, the Calphalon Stainless cookware pieces can be used with any type of utensil. Both cookware collections are covered by Calphalon’s full lifetime warranty. When it comes to the Calphalon Unison vs Contemporary comparison. The choice isn’t very obvious as most of the features are the same. 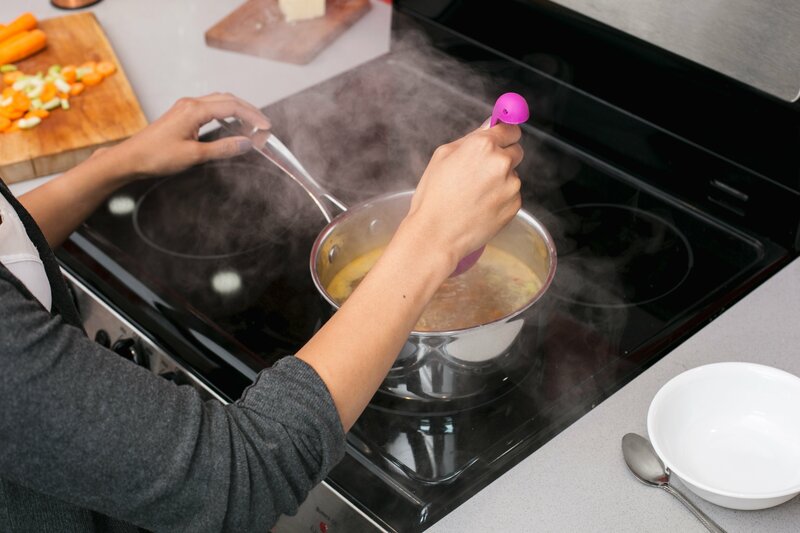 We like that the Unison has the dual nonstick surfaces that gives you more flexibility. So, if you are looking for nonstick only, go for the Unison. However, the Contemporary offers a line of stainless steel pans. It boils down to what you want as both collections are high quality.